When you need lawn care and lawn maintenance services in greater Danbury CT, call Grass Roots. We offer top notch landscaping, yard care, and grounds maintenance in western CT. Warm weather and sunny days are certainly great for your lawn (and weeds) - but wouldn't you rather spend your time enjoying the summer instead? Stop mowing, edging, mulching, trimming, planting and weeding... call in the lawn care pros at Grass Roots Inc. Grass Roots Inc. will keep the lawn looking great, shrubs and flower beds tidy and the mulch will always be fresh. With Grass Roots Inc. your lawn and grounds will keep your property looking its best. We will get your lawn and grounds maintenance on a schedule and keep it looking great year round. If your lawn is in need of a little TLC, call the Landscaping team from Grass Roots Inc. We provide a variety of routine lawn services, such as seasonal yard cleanups, lawn thatching, mulching, mowing and more. 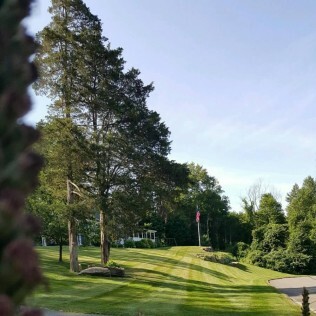 Grass Roots Inc is a full-service Connecticut landscaping company serving greater Danbury. In addition to lawn care, we offer landscape design, hardscaping, pest control and snow plowing. If you are putting your home up for sale, enhance your curb appeal with color, hardscaping, specimen trees, stonework, border gardens, ground cover plants, or whatever suits the setting.